There are many benefits to purchasing a certified Nissan vehicle. If you are in search of a used Altima, you may want to consider buying a certified model. Only Nissan models that meet extremely high guidelines qualify to be listed as a Certified Pre-Owned status. The car must be less than six years old and less than 80,000 miles on it, meaning you know it will have plenty of life left in it. Nissan also requires the vehicle to have a clean, non-branded title. Once all of this has been determined to be true, the model must pass a comprehensive 167 points Certified Pre-Owned inspection. Sheridan Nissan has an incredible selection of certified pre-owned Nissan Altima models for you to choose from. The Nissan Altima is a five-seater sedan that offers owners great fuel economy, plenty of power, and a distinctive exterior design. Recent Altima models come in five different trim levels: base, S, SR, SV, and SL. What type of power does a used Nissan Altima Get? The Altima’s power comes from either a 2.5-liter four-cylinder or a 3.5-liter six-cylinder engine. The four-cylinder will put out 179 horsepower and 177 pound-feet of torque. It uses a continuously variable transmission (CVT) that provides simulated gears made to make it feel more like a conventional automatic transmission. For more power buyers can go for the 3.5-liter V6 engine. This one pumps out 270 hp and 251 lb-ft of torque; it gives the Altima a 0-60 rating of 6.2 seconds. The Altima offers some of the best front seats in the class when it comes to comfort, particularly on those long hauls. The rear seating area gives plenty of leg and headroom for an average size adult. The trunk capacity is on par with others in the class, at 15.4 cubic feet. The Altima’s wide and low opening makes for easy loading. The features that you will get on your used Altima will depend on the trim level. 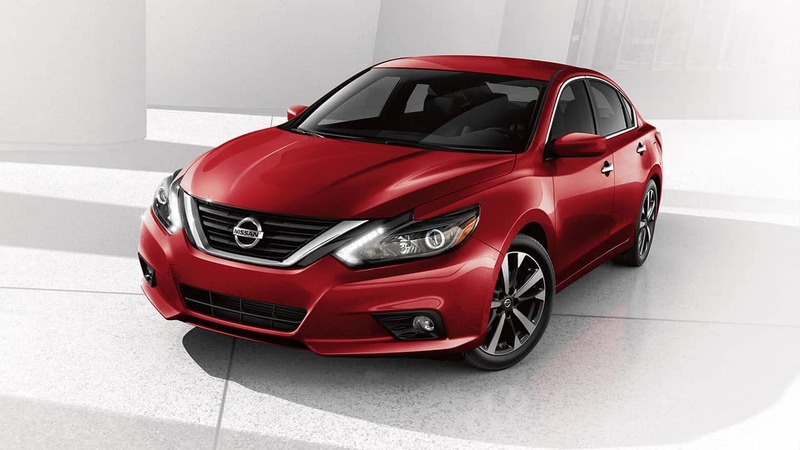 The Altima 2.5 in base trim includes keyless remote entry, push-button ignition, full power accessories, a six-way manually adjustable driver seat, 60/40-split folding rear seats, Bluetooth phone and audio connectivity, Easy-Fill Tire Alert system and more. The 2.5 S adds automatic headlights, Siri Eyes Free voice recognition for iPhone users, a rearview camera, and a six-speaker sound system with a 5-inch display. The SR trim builds upon the 2.5 S’ standard features with 18-inch alloy wheels, daytime running lights, foglights, a rear spoiler, a sport-tuned suspension, paddle shifters, and sport seats. Go with the top of the line 2.5 SL and you will get a heated steering wheel, leather upholstery, air vents for the rear seats, ambient interior lighting and a premium Bose nine-speaker sound system. The 3.5 SL gives you 18-inch wheels, LED headlights, front and rear parking sensors, a larger 7-inch color touchscreen, and a navigation system with Google connectivity.